This printable lamp can fold itself up for you #robotics « Adafruit Industries – Makers, hackers, artists, designers and engineers! 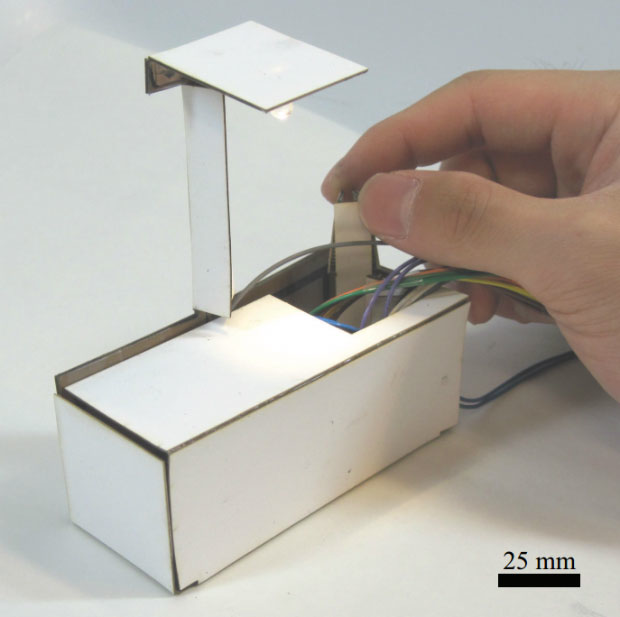 IEEE Spectrum has the story on this crazy cool printable lamp that folds itself up! Being able to print out a functional robot is a beautiful dream of cheap, accessible robotics for everyone. And right now, it’s impossible. But we’re making progress fast. A few years ago, we took a look at a project from MIT, Harvard, and the University of Pennsylvania that was developing soft robots with flexible, printed circuits. Last year, we met a robot that could be printed out flat, fold itself up, and then crawl around with the addition of a motor and battery. The thing that comes out of the printer (it’s a rather special sort of printer) is a flat multi-layer sandwich of shape-memory polymers (they take care of the actual folding, triggered by heat), thin layers of copper, layers of paper and foam for structure, and double-sided tape to keep it all stuck together.